After away games at Middlesbrough and Everton, games that brought us one point, we are back home tomorrow for a televised game against Manchester United. In each of our previous Premier League seasons this fixture has brought us our first points of the season. It was the first home game in 2009/10 when Robbie Blake scored that wonderful goal to give us a 1-0 win and two seasons ago it followed the home defeat against Chelsea and the loss at Swansea; on that occasion, as you will see below, it was a 0-0 draw. When the fixtures were released last June I wondered how many points we’d have before this fixture was played again and I think most of us would have been more than happy for that total to be 36 which, even with today’s disappointing results, leaves us five points clear of the drop zone with, in effect, just four games to play. There is no doubt that tomorrow’s game on paper is the toughest we have to play and there is no doubt we will have to turn in an excellent performance to get anything from the game. We’ll go into it with three former Manchester United players in our line up. The three are Tom Heaton, Michael Keane and Robbie Brady although they can only count one substitute appearance between them for United in the Premier League, that from Keane just eight days before his move to Burnley. He replaced Chris Smalling in a 1-1 draw at Sunderland. Keane is still with Burnley we can confirm. Sky informed us all a couple of days ago that he was leaving in the summer. Sean Dyche claimed he learned of it, as we all did, from the yellow bar. I don’t think anyone would be surprised to see him go given the clubs supposedly interested in him. I’ve lost count to be honest but if and when he does go I’m not expecting his destination to be Leicester, the club he supposedly signed for about three times last summer. Brady, the last of the three to join the Clarets, has been back in the team in the last couple of games. “I’m settling in well,” he said this week. “These things take time, just getting to know how the lads play. Brady had probably his best game yet at Goodison a week ago and will almost certainly be in tomorrow’s starting line up which I expect will show just the one change with Andre Gray, used as a substitute last week, coming back in for Sam Vokes who looks set to be ruled out with a hamstring injury. Scott Arfield is likely to be sidelined again although the good news is that Johann Berg Gudmundsson is available after injury and I expect him to be on the bench. The likely team is: Tom Heaton, Matt Lowton, Michael Keane, Ben Mee, Stephen Ward, George Boyd, Jeff Hendrick, Joey Barton, Robbie Brady, Ashley Barnes, Andre Gray. Subs: Nick Pope, Jon Flanagan, James Tarkowski, Ashley Westwood, Steven Defour, Johann Berg Gudmundsson, Dan Agyei. There is no doubt that we are playing against one of the top clubs in the country and it is almost a shock to see that Manchester United have not lifted the Premier League title now for four years since Sir Alex Ferguson retired. Almost a year with David Moyes, now struggling at Sunderland, two with Louis van Gaal, they are now under the stewardship of Jose Mourinho who currently has the team in fifth place in the league with only three defeats all season. It’s home draws as much as anything else that have prevented them getting into the Champions League positions thus far with only seven wins but away from Old Trafford their form is much better with nine of their 14 games won. Only Watford and Chelsea have taken maximum points from them in home games, showing just how difficult a game we face no matter which players may or may not be ruled out with injury. One player we won’t see is Zlatan Ibrahimovic who, missed chances apart, turned in one of the best individual performances I’ve seen all season in our 0-0 draw at United. He suffered a cruciate ligament injury in Thursday’s Europa League game against Anderlecht as did Marcos Rojo. Both players will be out of action for some considerable time. Mourinho has been bemoaning the mounting injury problems which will also see all of Smalling, Phil Jones and Juan Mata miss out but he does have Ashley Young and Ander Herrera to return, having been left out in midweek, and such is his squad replacements could be of the quality of Wayne Rooney. The media in Manchester who incredibly send photographers to the team hotel to see who does and who doesn’t turn up, are reporting that both Axel Tuanzebe and Timothy Fosu-Mensah were there although there was no sign of Antonio Valencia. Rojo and Ibrahimovic apart, the team could be similar to that which beat Chelsea last week when they lined up: David de Gea, Eric Bailly, Marcos Rojo, Matteo Darmian, Antonio Valencia, Ander Herrera, Marouane Fellaini, Paul Pogba, Ashley Young, Marcus Rashford, Jesse Lingard. Subs: Sergio Romero, Daley Blind, Timothy Fosu-Mensah, Luke Shaw, Michael Carrick, Henrikh Mkhitaryan, Zlatan Ibrahimovic. Both sides were looking for a first win of the season last time we met at Turf Moor. We’d lost at home to Chelsea and at Swansea while United had lost at home against Swansea but got a 1-1 draw at Sunderland. Neither side were able to get that first win with the game ending 0-0. United included players such as Robin van Persie and Wayne Rooney with Louis van Gaal giving a debut to new record signing Angel Di Maria who was reported to have cost more than Burnley had spent in transfers in the club’s history. We started the game really well and were unfortunate not to take the lead. David Jones saw his free kick hit the bar and David de Gea then saved well from Lukas Jutkiewicz. United’s best chance of the game came soon after when Tom Heaton saved well from van Persie. But it was Burnley on top for most of the first half and it ended with de Gea making a stunning save to deny Jones who had been brilliant against his former club. Nothing much changed in the second half with Burnley the better side. Matt Taylor saw his free kick hit the roof of the net and Danny Ings came into the game more and more as he gave United plenty of problems. Towards the end they came back at us in an attempt to win the game but had they done so it would have been undeserved and it was Burnley who had to be disappointed to win only a point from this goalless draw. 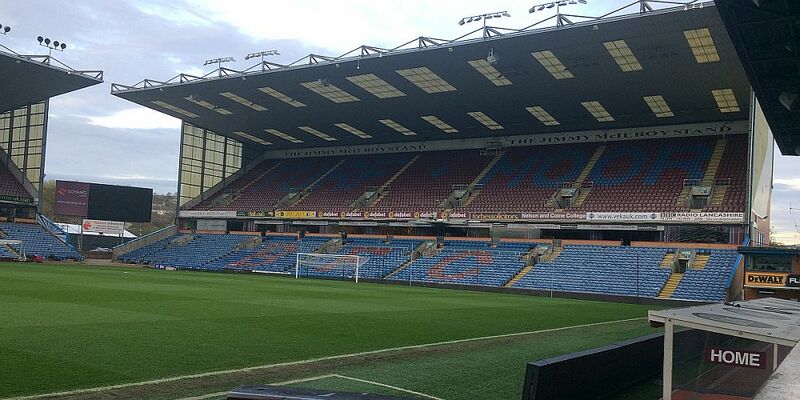 Burnley: Tom Heaton, Kieran Trippier, Michael Duff, Jason Shackell, Ben Mee, Scott Arfield, Dean Marney, David Jones, Matt Taylor (Steven Reid 88), Danny Ings (Ashley Barnes 78), Lukas Jutkiewicz. Subs not used: Matt Gilks, Kevin Long, Stephen Ward, Ross Wallace, Marvin Sordell. Manchester United: David de Gea, Jonny Evans, Phil Jones, Tyler Blackett, Antonio Valencia, Juan Mata (Adnan Januzaj 87), Darren Fletcher, Angel Di Maria (Anderson 70), Ashley Young, Wayne Rooney, Robin van Persie (Danny Welbeck 73). Subs not used: Ben Amos, Michael Keane, Reece James, Javier Hernandez.